You must register each Operations Dashboard extension you create in your ArcGIS organization. You will need to be signed in as an Administrator. In a browser window, sign in to your ArcGIS organization. Click Add Item and choose An application. 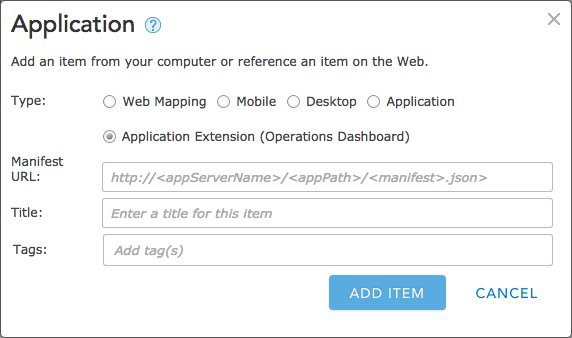 Choose Application Extension (Operations Dashboard), and provide the URL to your manifest file. The title of your item will automatically populate from your manifest file. You can also manually edit the title. Share the item with groups within your organization.